The Lincoln Stars will only play one game this weekend, and it will be a Friday night home tilt at the IceBox against the Des Moines Buccaneeers. The puck will drop at 7:05pm CST tonight. If you can't make it to the game tonight, you can follow the boxscore online via Pointstreak, listen to Stars radio announcer Mike Melbye on KLMS 1480 AM, or watch the game on FASTHockey for a fee. The Bucs currently have a record of 13-15-3 (29 points), and are fifth place in the USHL Western Conference In their last 8 games leading up to the matchup tonight, the Bucs sport a record of 2-5-1 and have been outscored 35-26 in those eight contests. These two teams have only faced each other one other time this season, and that was one of the craziest games I've ever seen. 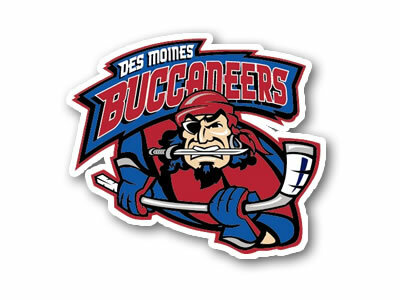 In Des Moines on Friday, December 30th, the Stars beat the Bucs in an overtime shootout by a score of 7-6. If you want to watch video highlights from that game, click here. Lincoln started that game on fire, and marched out to a commanding 6-1 lead early in the second period. After that, the roof caved in for the Stars as Des Moines roared back with five unanswered goals to knot it up at 6-6 and send it to OT. Luckily for the Stars, they were able to best the Bucs in the shootout. The Stars will be looking to snap out of their current two-game losing streak tonight with a strong effort against the Bucs, but it won't be easy because of a number of Lincoln players out of the lineup due to league suspension. According to the Pointstreak transaction page, the following five players have been suspended for one game due to their involvement in the Stars-Lancers line brawl last weekend in Omaha: Jackson Teichroeb (G), Paul LaDue (D), Zach Frye (D), Brent Tate (F), and Will Suter (F). If you were curious, the league suspended four players from the Lancers for one game, according to this article. Lancers forward Mark Miller, who started the brawl with a sucker-punch on Will Suter, was not suspended. I guess I shouldn't be surprised. This might sound a little weird considering it's a late January game against a fifth place team, but I believe this is a must-win situation for the Stars. Lincoln only plays one game this weekend, so there is only one opportunity to earn two points. With Fargo and Waterloo both playing three games this week, those two teams have plenty of opportunities to earn some points and potentially jump the Stars in the standings. It's a little early to talk playoffs, but the top two teams in both the Eastern and Western conferences earn a first round playoff bye. So finishing in the top two at the end of the season is a big deal. Like I stated above, it's not going to be easy with so many players out of the lineup tonight. Charles Williams will get the start, and I assume the Stars will bring in a backup goaltender from one of the local junior teams to sit on the bench. With two defensemen out due to suspension, and Colton Saucerman done for the season due to injury, the Stars will only dress four d-men tonight. Forward Logan Smith has been used as a defenseman in the past, so I expect to see that happen against the Bucs. With only the one game to earn two points, and with so many players out of the lineup, the Stars will definitely need support from the home crowd tonight. Be loud! Short bench. Hope the guys are rested and ready to play some big minutes tonight. Go Stars!